The seasonal weather arrived just in time for the Canterbury Orchestra's Summer Concert held in the magnificent new Colyer-Fergusson Hall at the University of Kent. lt has been a dream of musicians in this area for many years to have a purpose built concert hall in East Kent, and at last that dream has been realised. lt was this writer’s first time there and one could see how these perfect surroundings helped inspire the orchestra to produce a wonderful concert. The acoustics are excellent and the near capacity audience too must have provided an extra stimulus to the players. Under Andrew Lowen's excellent direction, the orchestra provided us with a very popular and well balanced programme beginning with Malcolm Arnold’s Little Suite No.2. This was a very typical example of the composer’s style with its dramatic opening and slightly quirky tunes. The orchestra really conveyed the spirit of the music well with some excellent string playing under their leader, Amanda Wyatt. The slower second movement had some lovely shaping of phrases -indeed the shaping of the whole movement was well handled. There was also some beautiful horn playing and a good pianissimo section in the woodwind. The percussion started the last movement very effectively with a strong rhythmic drive leading to a very assured performance from the whole orchestra. We were then treated to a magnificent performance of the Elgar Cello Concerto played by the incredibly talented young Australian cellist, Pei-Jee Ng. The programme quoted from the Financial Times which described this young man as 'one of those rare musicians who makes you unaware of technique’, which was so true. He forced everyone to be as involved in the music as he himself certainly was. He had clearly created an excellent rapport with the conductor, who once again handled the complexities of conducting a concerto admirably. Following the cellist’s dramatic opening, the orchestra immediately got into the spirit of the work, with much good ensemble playing. Particularly creditable were the pianissimos in the orchestra, which allowed the cello, (not the loudest of instruments), to shine through. In the final movement the orchestra were given their head for a short while, which they certainly enjoyed, and there was some excellent interplay between soloist and orchestra. ln contrast, the moments of pathos in the work were very well sustained, including once again some excellent quiet and controlled playing. At the end of the work the audience gave both soloist and orchestra a well-deserved long and rapturous applause. Allegro. From my seating position this latter produced a very exciting stereo effect. During this final movement the orchestra really appeared to be enjoying themselves in spite of the complexity of the music and an occasional slight lapse of unanimity. All in all this was a splendid concert in an equally splendid environment. The orchestra under Andrew’s expert guidance produced a performance of which they may be justly proud. This writer went away feeling he had enjoyed a great evening. 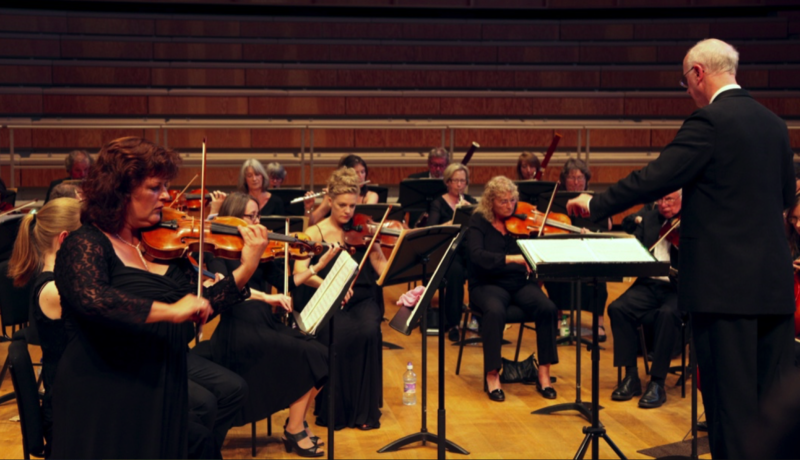 Details of forthcoming concerts are also listed in the Events Diary of the Canterbury Arts Council website and on the Orchestra's Facebook page. Interested in playing with the Canterbury Orchestra? Call Nicky Pound, Canterbury Orchestra Manager on 01304 812755 or email us to find out whether we have vacancies.